It is thought the cub was unable to eat for two weeks because the can was stuck to its tongue. 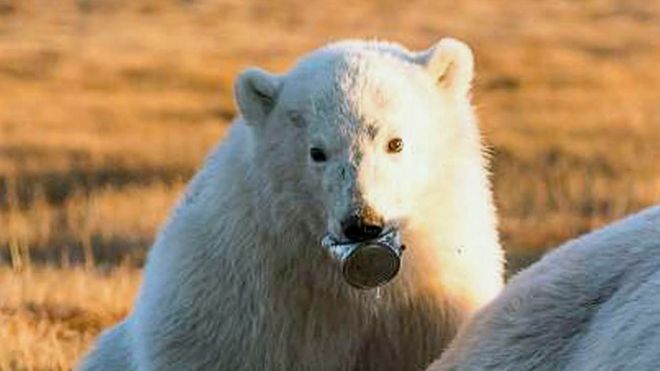 The senior wildlife officer of a remote Russian island has called on people to be careful when discarding litter after the emergence of photos of a polar bear cub with a tin can stuck in its mouth. Alexander Gruzdev, head of Wrangel Island’s nature reserve, told the BBC the cub was unable to move the can for two weeks and was becoming stressed. It is believed that the jagged edges of the can got wedged in the cub’s mouth. The can was removed after rangers shot the bear with tranquilisers. The bear was spotted by them earlier in the autumn with the condensed milk can in its mouth as it was following its mother who was scavenging for food on the remote island, The Siberian Times reported last week.”But the case highlights the risk to wild animals from man’s garbage.”Mr Gruzdev said that there have been several other cases of human litter affecting the island’s wildlife “Animals can eat plastic bags in which food has been stored,” he said. The rangers tranquilised both the cub and its mother before carefully removing the can from the yearling’s tongue with the minimum of bleeding. According to a BBC1 programme on litter, “Don’t Mess With Me” aired November 2014, the UK generates 30 million tons of litter per year, costing one billion pounds to clear up. The Independent newspaper, 03/12/14, “Litter costs hundreds of millions of pounds a year in “hidden costs” Keep Britain Tidy has found.As well as the cost of keeping streets tidy, litter also increases criminal activity, affects mental well-being and lower house prices, the report, by Eunomics research and consulting said. Cigarette butts are the most common type of litter, found at 82% of sites in England, rising to 99% in main retail areas. It costs £1bn a year to clean the streets of England. Scotland spends £75m a year dealing with litter and flytipping. 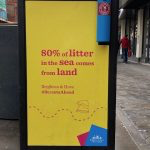 62%of peple in England drop litter, only 28% admitting to it. 50% of people in Wales have dropped litter. 250m items of litter are dropped in Scotland each year. 46% of people in Scotland admit to dropping litter. 57% of Welsh people don’t see a problem with dropping litter if an area is already run down.Removing litter from coastal areas costs Scotland £1m per year. Fast food litter was found at 32% of 10,600 sites in 54 local authority areas in England in 2013. 2.25m pieces of litter are dropped o the streets of Britain each day. Dropping litter in a public place is a crime. The fine for doing so (at time of printing, 2014) is between £50 and £80. Dog fouling fines can cost up to £100. Source: Keep Britain Tidy, Local Environmental Quality Survey of England, Keep Wales Tidy, Keep Scotland Beautiful – published in the Metro newspaper May 28 2014. 250 million easily visible items are dropped in Scotland every year. 170 incidents of flytipping are reported in Scotland every year. More than £1 million per week is spent on clearing litter.